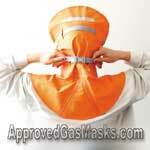 Simply remove hood from packaging, insert NBC or fire filter, put it on and tighten straps, cover inlet to check fit and escape. 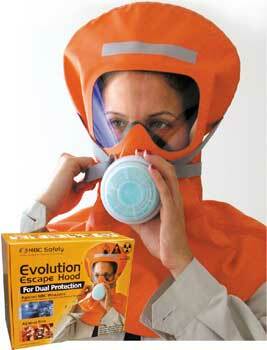 The #1 choice for protection from BOTH Fire/Smoke & NBC warfare agents. 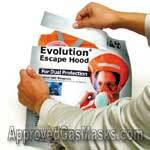 Unlike other escape hoods, the Evolution 1000 is escape hood is made of NBC Resistant & Fire Retardant Fabric. The extra-wide, bonded, flexible PVC lens provides an unsurpassed range of vision & an extremely high level of protection against smoke, biological, chemical & other contaminates. 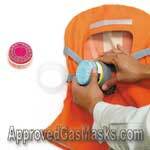 The extra-wide lens allows for excellent visibility & easy face recognition by others during any emergency. High Visibility: Made of high visibility bright orange material, to enable rescue personnel to locate you quickly in any emergency. In addition, the mask features a highly reflective band on the face designed to reflect light (from search lights or flash lights) in low visibility situations. Excellent fit & protection: The hood fits nearly all adults & extends to the mid-chest, protecting your head, neck & covers any gaps found around the collar of your protective suit. 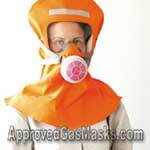 The hood incorporates a snug but comfortable elastic seal around the neck area to prevent gasses from seeping upwards into the mask. The Evolution 1000 utilizes a 4 point strap system around the head that can be tightened easily to ensure a snug fit around your nose & mouth by simply pulling on the 2 tightening straps on the back of the mask. 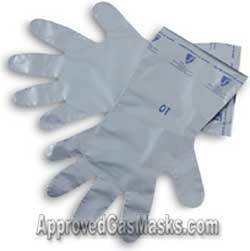 In addition, there is a quick release clip for easy removal of the mask without having to loosen straps, etc. Premium Filtration: Includes 2 filters: 1 - NBC filter provides excellent protection against chemical agents, nuclear particulates & biological agents. Also included, 1 - Fire / Smoke filter which is specially designed to provide enhanced protection against smoke & gasses created by combustion. 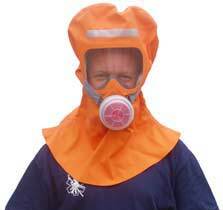 This highly specialized FIre filter provides far greater protection against smoke & fire than conventional escape hoods or NBC gas masks. 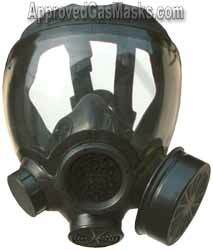 No training: The Evolution 1000 is an emergency escape gas mask designed to be easy to use, and unlike many other masks, does not require professional training. 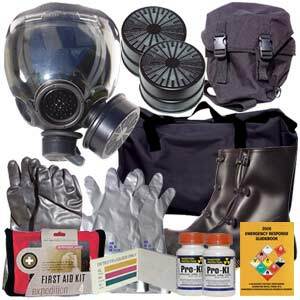 Follow the simple instructions for use , then escape the contaminated area as quickly as possible. 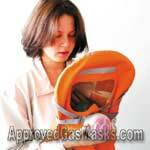 This gas mask is designed to fit nearly all adults & will also fit children (of average size) as young as 10 years old. Carry Bag Included: Nylon carry bag with shoulder strap & belt connection rings is included. Pack is compact, yet has velcro pockets designed to fit 2 spare filters & plenty of room for more filters if needed. Material: water-repellent nylon, beige color. The most versatile, easy to use & affordable protective mask ANYWHERE! 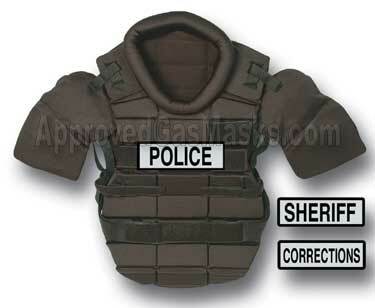 government agencies, hotels, schools & universities & civilians. and wholesale pricing information at 1.800.547.4557 or email us here.